It’s been quite awhile since I missed a day in this journal, but yesterday was one of those days. I woke up late yesterday (8:30AM) and I got absolutely nothing done on I,Q. 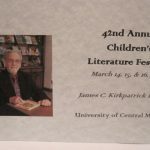 I’m at the 42nd Annual Children’s Literature Festival in Warrensburg, MO, which is probably my favorite event of the year and the oldest and perhaps biggist of its kind in the U.S. 5000 kids over the next two days and 1000 teachers and parents (I will not be speaking to all of them). There are 41 authors here, including Marie (who drove up from Arkansas with our daughter and grandsons #1 and #2), all of which accounts for why I didn’t get any work done on IQ2, but I was up at 3:30 this morning, tip-toed down to the lobby to work on I,Q before I headed out to the festival. William Anderson, Sandy Asher, Darleen Beard, Gary Blackwood, Joan Carris, J.B. Cheaney, Eileen Christelow, Sneed Collard, Shave Evans, Alane Ferguson, Mike Graf, Jan Greenburg, Vicki Grove, Mary Downing Haun, Cheryl Harness, David Harrison, Patricia Hermes, Jeanette Ingold, Richard Jennings, Veda Boyd Jones, Peg Kehret, Alexandria LaFaye, Dandi Daley Mackall, Claudia Mills, Anna Myers, Dorinda Nicholson, Marc Tyler Nobleman, P.J. Petersen, Barbara Robinson, Breanda Seabrooke, Gloria Skurzynski, Marie Smith (wife and best friend forever), Brad Sneed, Michael P. Spradlin, Roderick Townley, Terry Trueman, Vivian Vandevelde, Suzanne Williams, June Rae Woods. It’s a bit difficult to get any writing done with so many author friends hanging around. I only see some of them once a year and there is always a lot to catch up on. Mike Spradlin brought his own fan club. I sat next to his nephew, Alex, at the luncheon yesterday. He’s a brilliant young man. 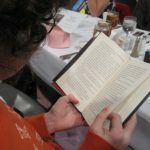 Here he is reading my novel “Tentacles” during the meal, which I found very good for my digestion. After lunch we signed books then went to a reception. After the reception we stopped by Naomi and Dennis Williamson’s (Naomi is the head honcho of the Festival) home for a “minute” which turned into a Texas Hold ‘Em game that lasted a lot longer than a minute. Today I spoke to three large groups helped by a bunch of terrific volunteers. The kids and teachers get a chance to hear several authors speak during the day. If you ever get a chance to come to this festival don’t pass it up. It’s wonderful! (And a great way for you to see how authors present to young people if you’re thinking it about inviting an author to you’re school for a visit). The only glitch today was a flat tire on my rental car. Tire’s shot. Looks like I’ll be heading back to the airport tomorrow on one of those silly donut tires. I was at your last presentation at the literature fest. Your presentation was amazing!!! Just found out there were 1100 parents and children who signed in at the Independence Celebration of Learning. I knew we were busy and now I know why. Just wonder how many books you signed that day. We sold around $800.00 worth of Roland Smith books at the book sales and the book fair. Hi Janice, it seemed like there were a lot of people in the gym. That’s a fabulous turn out. Congratulations! Come Visit gypsum Creek Middle school in Gypsum Colorado!